I was chatting with a friend and a seasoned mom about her grown kids, and how she’s moved on to grandma status. She was marveling over how big my kids are already. 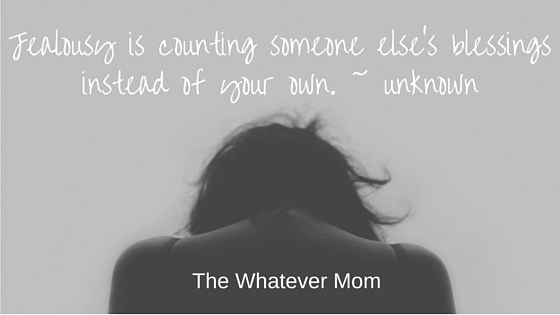 As we continued the conversation about my life with kids I commented, “I think it would be different if I had a mom, or a sister I could call to come over when I need help.” She replied, “oh so you do this alone, ALONE.” Yep. I do have a husband, but he works outside of the home most days and the larger portion of the child rearing falls on me. Yes, I know single parents have it more difficult and I would never minimize their hard work. My own mother is a single mom. However, she was able to send us off to my grandparents on weekends and during the summer. My mom lives several hours away and is unable to drive. Growing up I loved when my aunts and uncles would drop in to spend time with us. It is rare my family makes the trip to visit us. I remember running around the yard and having sleep overs with my cousins. My kids are the youngest in our family. I hate that I get jealous. It’s typically not in my nature. But, here I am. I just want my kids to have what other kids have, a big family to cherish them. I want my kids to have fun memories of jumping on beds at sleep overs with their cousins. Or, spending holidays surrounded by family. It would be really cool if they had an aunt or uncle to take them out to the movies or on picnics. It isn’t about having time for me, or getting a regular date night with my husband (although either would be appreciated). It’s about my kids having more than just mom and dad. As twins I know they’ll always have each other, but that isn’t a relationship they can fully appreciate until much older. I worry they won’t get to have the closeness with their extended family like I did growing up. I worry one day they will be disappointed with their childhood. Yes, I do this alone without the physical and emotional support an extended family can provide. It’s hard most days. It’s lonely and I get jealous of my friends. I have accepted it’s just the four of us. Thankfully, I am learning to move my bitterness to happiness for my friends. I don’t know why life worked out this way, but I know I can’t change it. So, we make the best of what we have together, even if it’s just me, a husband and two kids. I am in a different situation because I am divorced from my boys father and he & his new wife share custody with us, so Chris and I get a lot of time off. I can’t imagine not getting a break. Aw it can definitely be hard feeling alone. My whole family is 2 states away from me (my son has my in-laws close-by, though, and I do get to revel in the mentioned alone time) and I struggled with these feeling before I met my husband. I think friends can step into the roles of family/cousins/grandma 😉 and help you feel more supported. I get it. I come from a small family, and my daughter’s father is not around. His family doesn’t know us. I’ve gotten close with many of our neighbors, most of whom are older with grown children. They all love my daughter and help me out when I need something. Blood doesn’t make family ! It’s like she has extra grandparents ! Even one of the aides at school seems to have taken on the role of an aunt… Take support where and when you can !! We have definitely been fortunate enough to build our own family here. I have some really great friends and very supportive neighbors I couldn’t live without! Oh, i totally understand that feeling. I have family close by but I always feel guilty… so I end up passing on childcare ALL the time. It’s exhausting. That’s really wonderful! I grew up the same way. Our house was always full!! It is ok to feel bitter because you have been through a lot. I wish that you could get more time to yourself but parenting is a hard slog and you are doing so well. Thank you. That’s very sweet of you to say! I love that quote. I also love how honest and open your writing is. My parents moved back to the area when my sister and I had kids. What’s funny is that while having them nearby is a blessing, there’s a different kind of frustration and jealousy that happens with us – usually over who may be spending time with who, and how much. We only go out about once a year, as well. We do not have any kids yet, but I know if Adam and I did have kids we might be in a similar situation; we do not live near any family members out here since we moved to Arizona, so I highly doubt we will have time for date nights or small trips if/when we have children. Keep your head up, lady! You are allowed to feel moments of frustration and wish you had the luxuries of others–it only makes you human! I figure since there’s nothing I can do about it, I will try to just focus on the positives– she loves her grandkids dearly, and we do get occasional babysitting, so at least it’s something! lol. But it’s hard not to be jealous especially when it comes to our kids. I am in a similar situation. My mom lives close, but travels so much for work we rarely see her. Our dates tend to be putting the kids to bed and trying to watch half a movie before the baby wakes up 🙂 I’m sure it will get easier as the kids get older though…at least that is what I tell myself! Expecting our first, I completely understand. I’m already so jealous of the moms who can call their mom and have them come watch the kids at a moment’s notice, even just so they can run errands! My situation is similar in that my kids have no grandparents. My parents aren’t in great health and have a hard time traveling to see us and my inlaws are the same. I, too, struggle with jealousy over moms who have awesome, involved grandparents, especially when my friends complain about their in-laws(who constantly babysit, help out, etc). Sometimes, people don’t realize how much help/support they have, even if it’s not perfect all the time!!!! Awe Twin Mama you are so awesome! (Maybe that’s a twin mom thing too). It does help to know I’m not the only twin mama struggling. Thank you so much for taking the time to reply with kind words and sharing your experience too! All my best to you and your family! Omg I definitely feel where you’re coming from! Hubby and I rarely get a date night because there isn’t someone to babysit….. Definitely puts a strain on things….